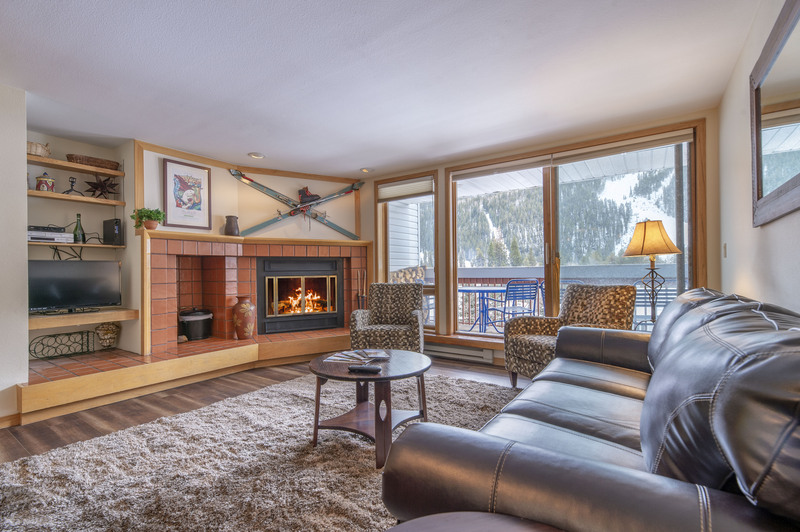 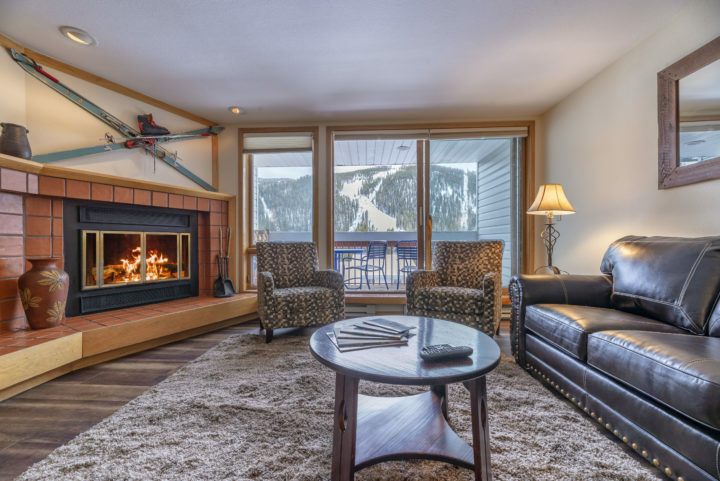 Liftside #307 has a panoramic view of the ski runs from both living rooms and the private deck. Guests enter the unit on the 1st level (3rd floor). 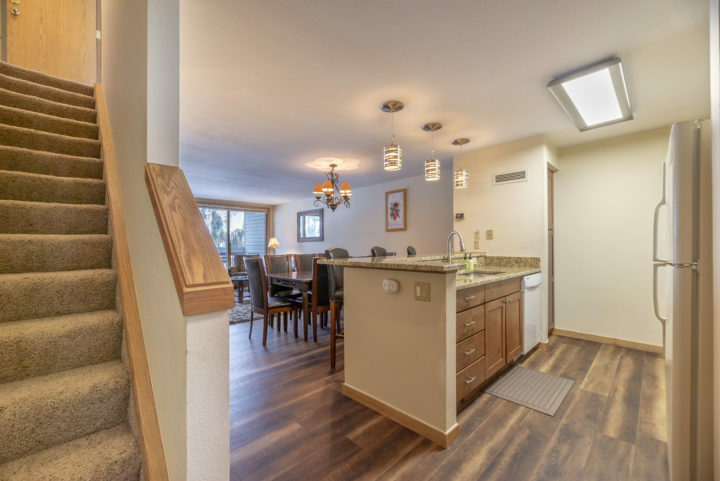 Stairs to 2nd level on left. 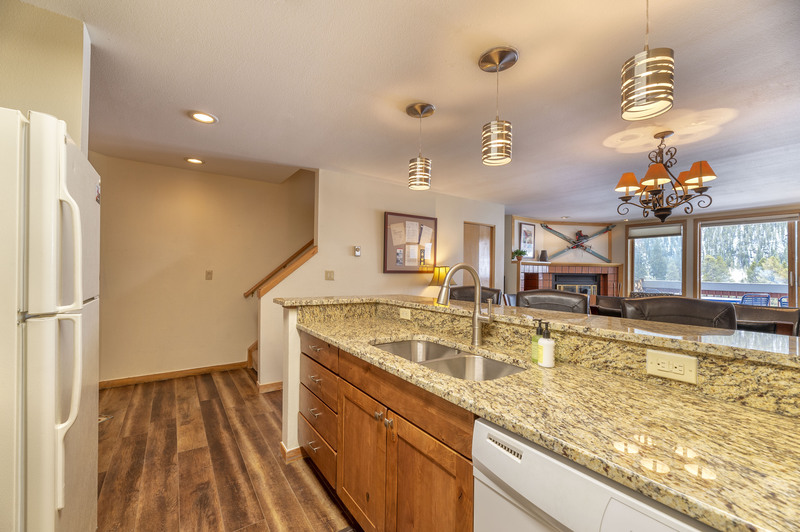 The 1st level has the kitchen, living room, deck, master bedroom, and Bath 1. 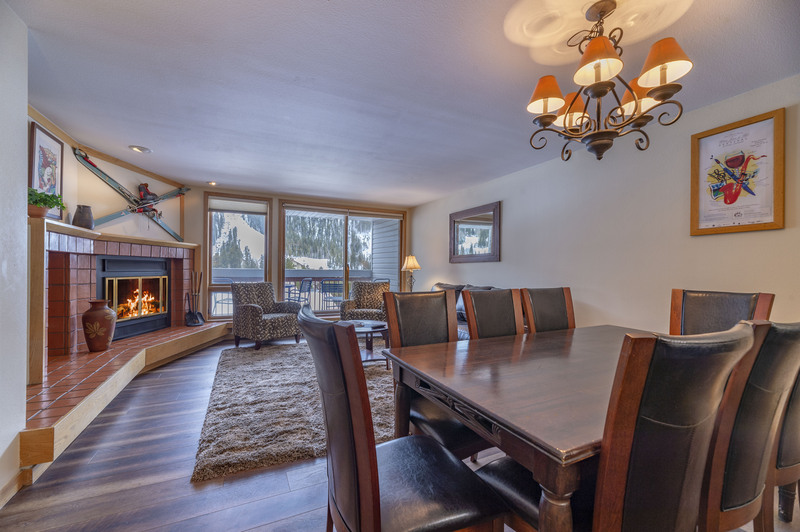 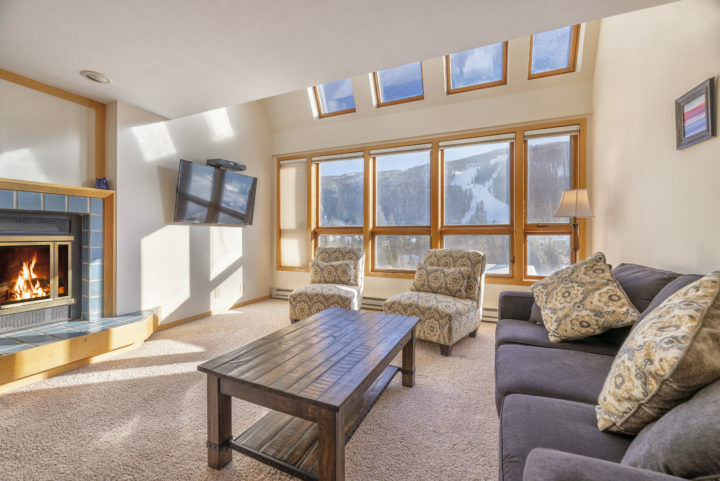 Both living rooms have an unobstructed view of the ski runs (day & night). 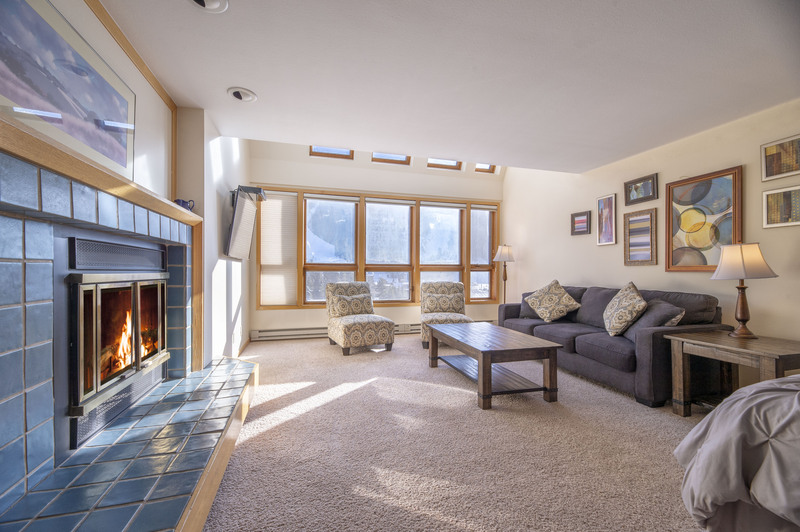 Living Room 1--fireplace, TV1, Queen fold out (sleeps 2). Newly renovated kitchen with wood flooring and granite counters. 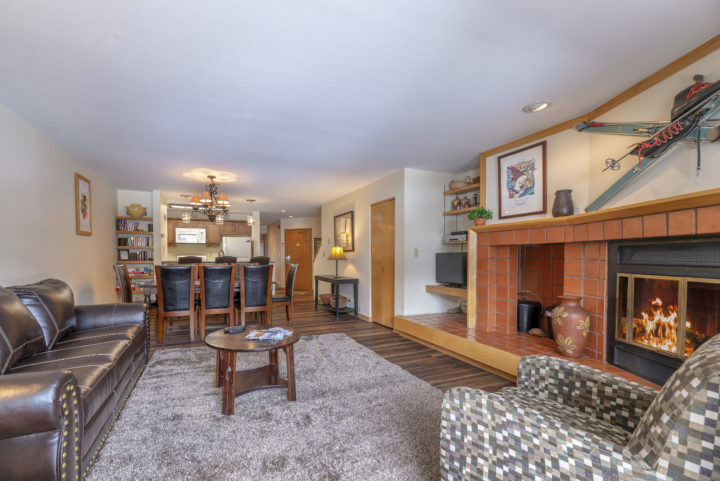 Living Room 2 (Upper level)--2nd fireplace, TV3, Queen foldout, wide view of the ski runs. Upper level has two Queen beds, Queen fold out, portable Twin futon, and private bath (sleeps 6-7 on that level). 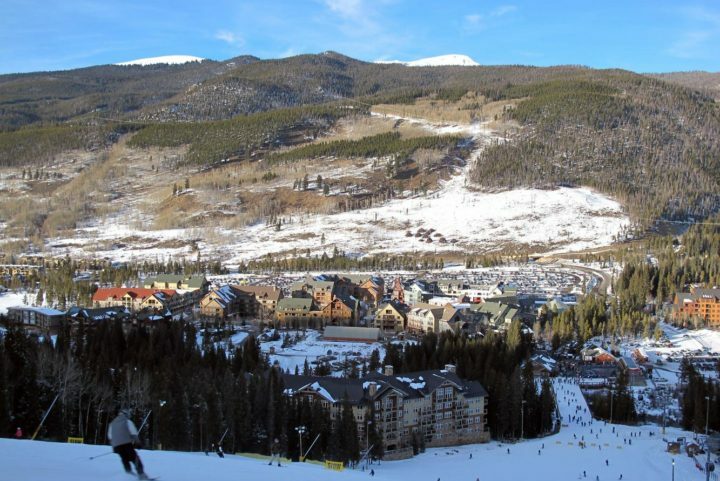 Wide angle shot--makes the ski runs look farther away but shows more of the mile-wide view of the slopes. 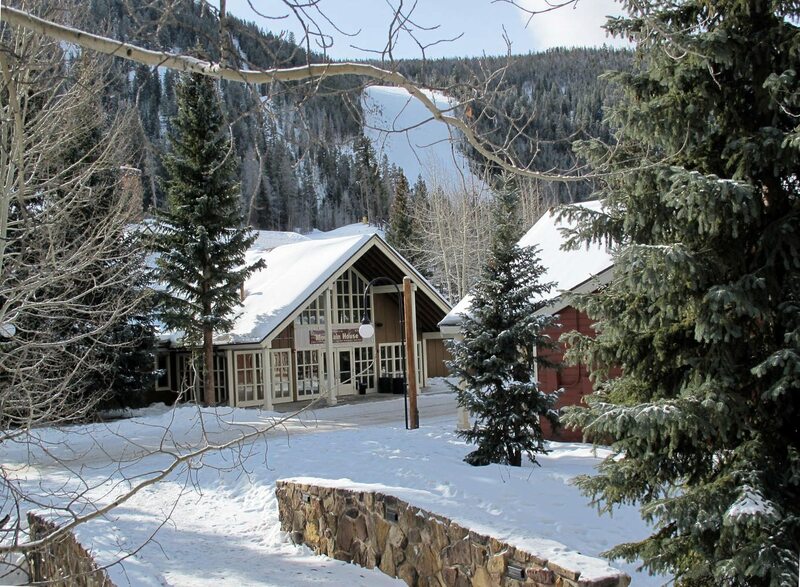 Walk to the Mountain House via the pedestrian bridge over the creek. 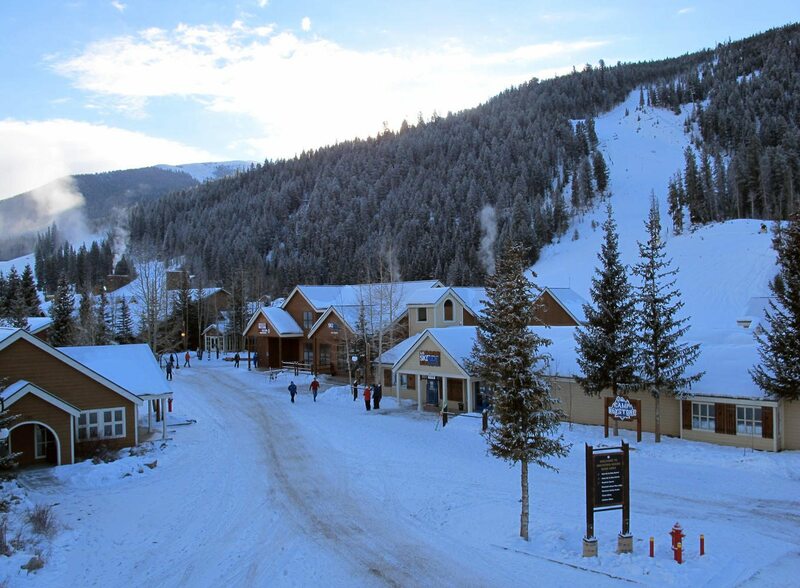 Take the Peru lift up to ski down to the River Run base area (you can also walk or shuttle over). 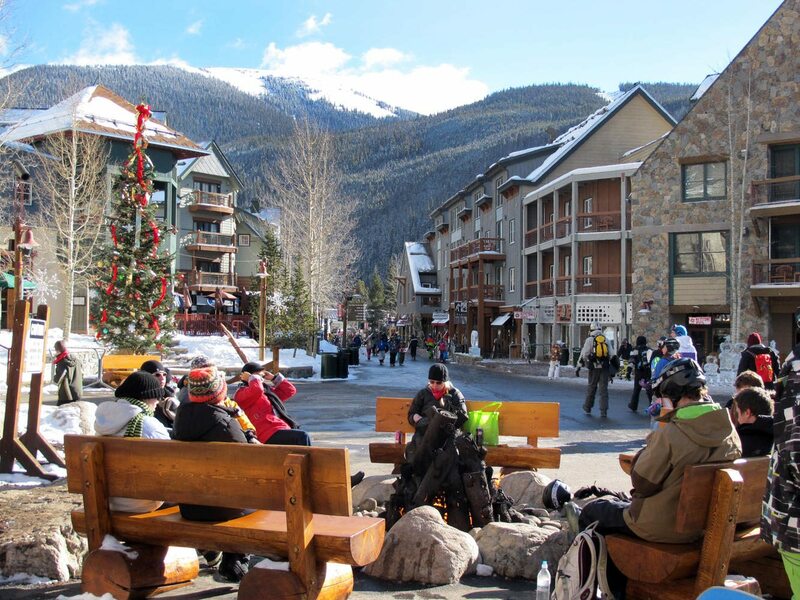 River Run Village (gondola, ski school, day care, cafes, night life). 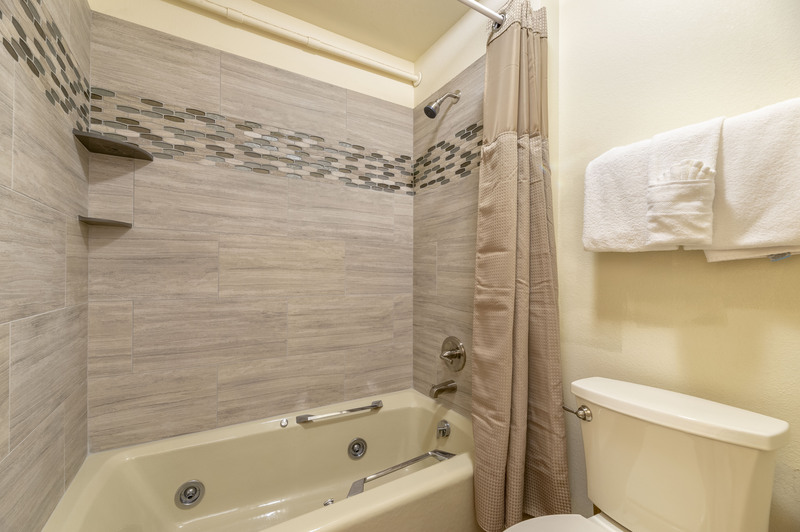 2BR/2 Bath (Sleeps 10+). 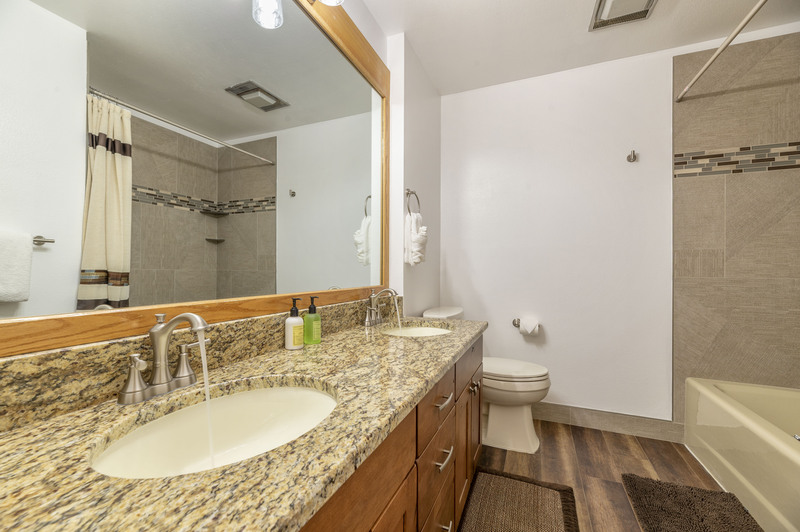 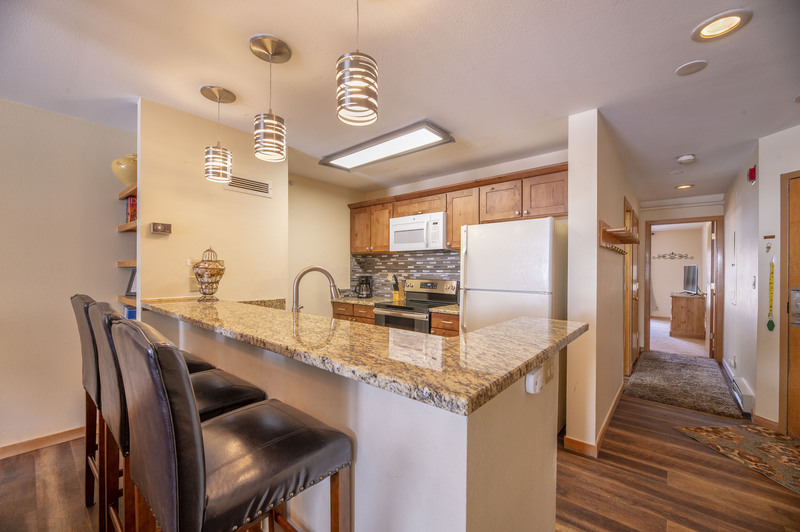 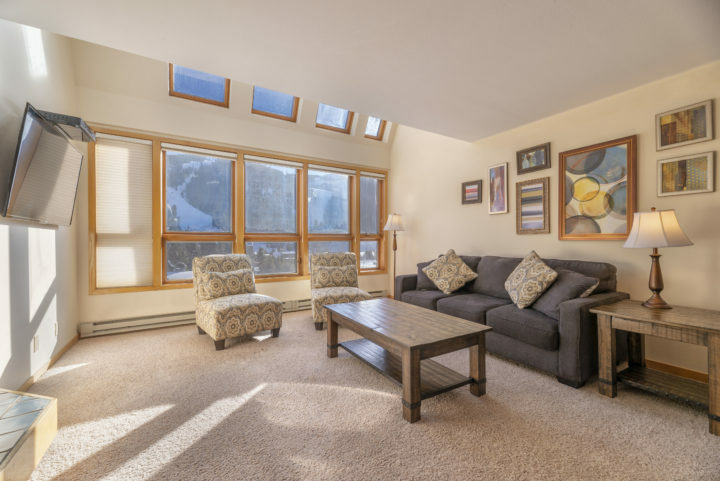 Large 2 BR/2 Bath (Sleeps 10; 1600 sq. 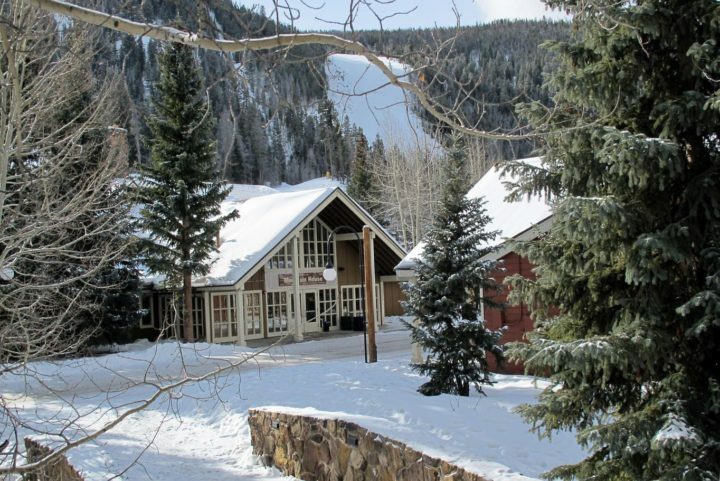 ft.) near the Mountain House. Unit has 2 living rooms (and 2 fireplaces—wood provided) on different levels. 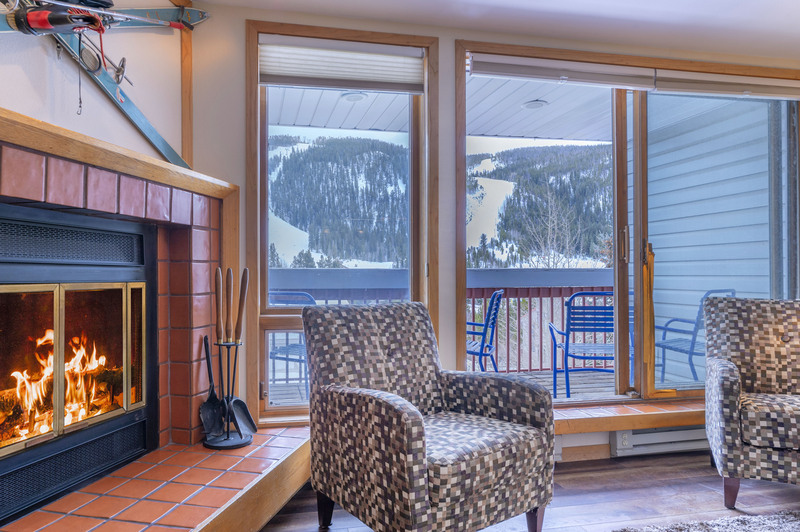 Direct ski run view from both living rooms and private deck. 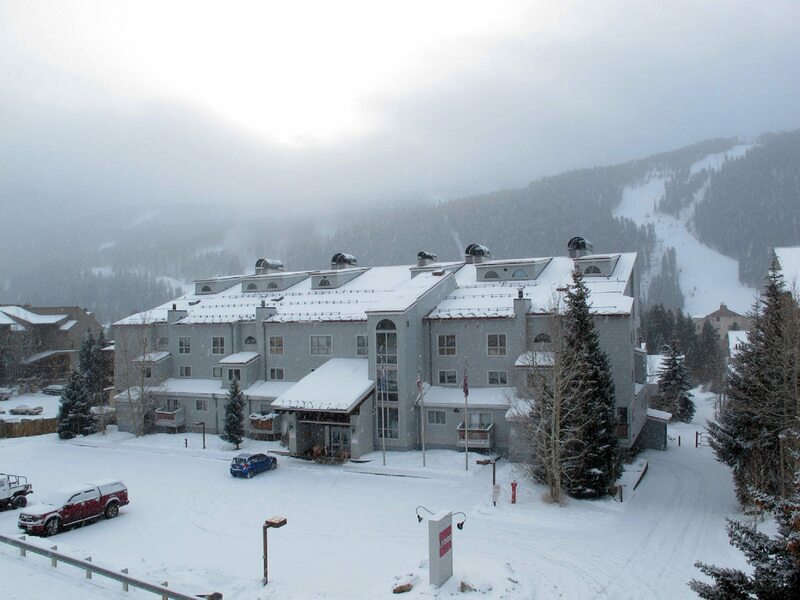 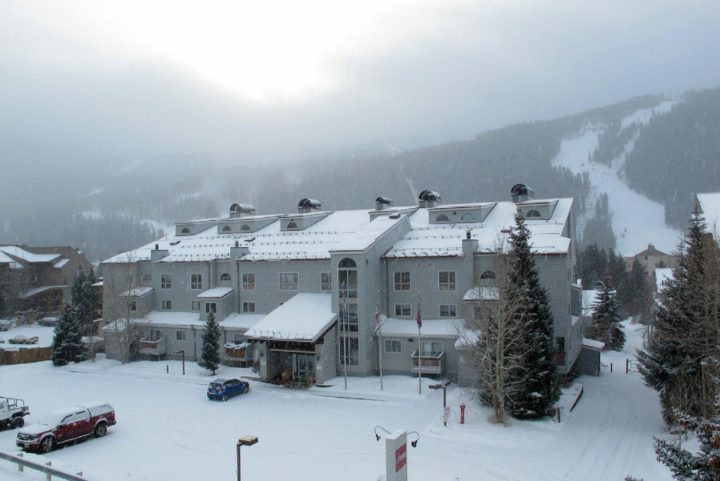 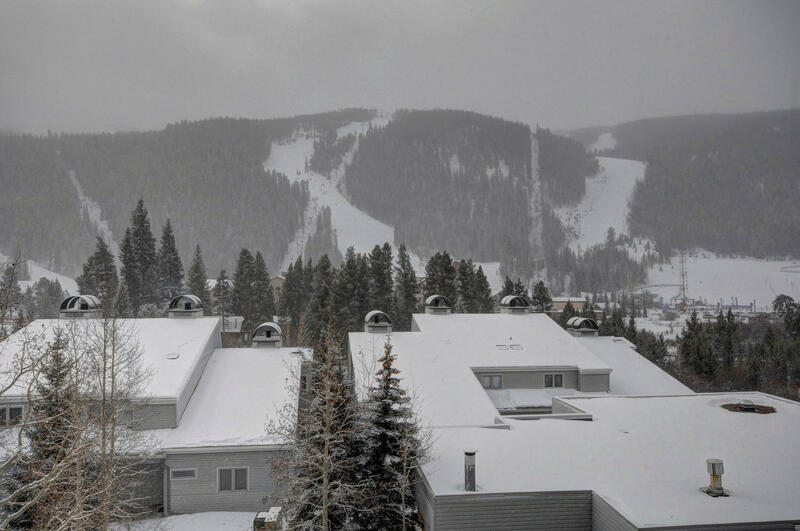 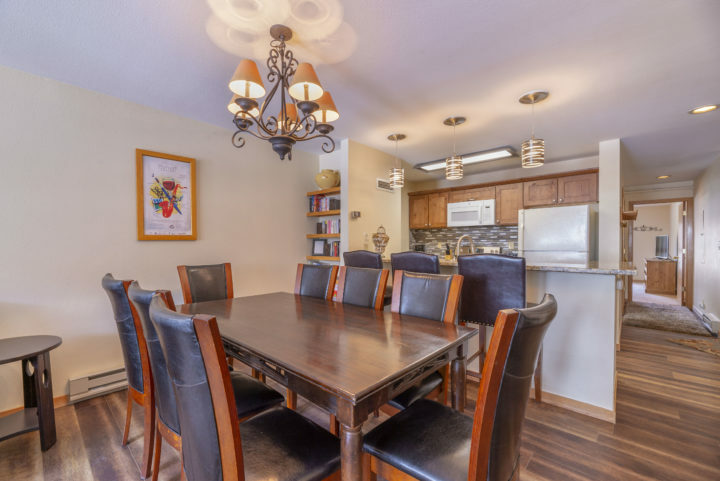 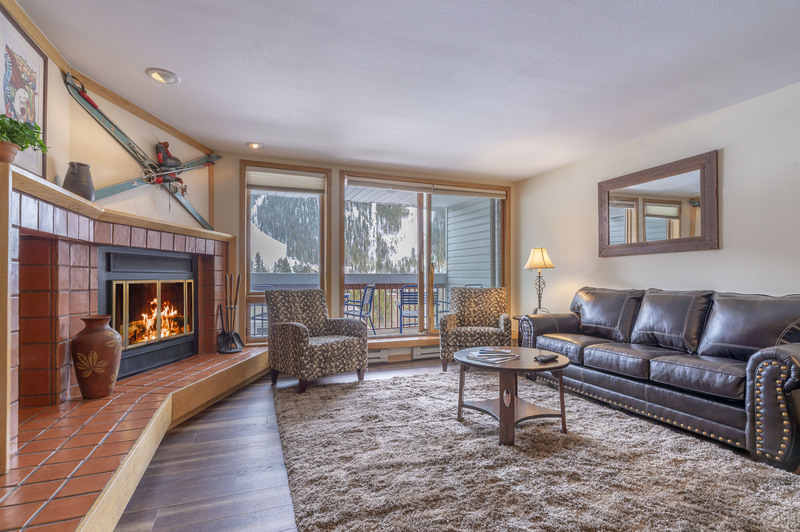 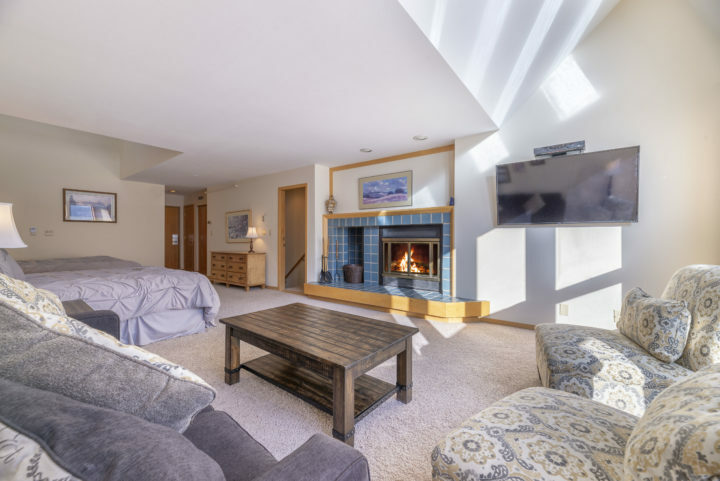 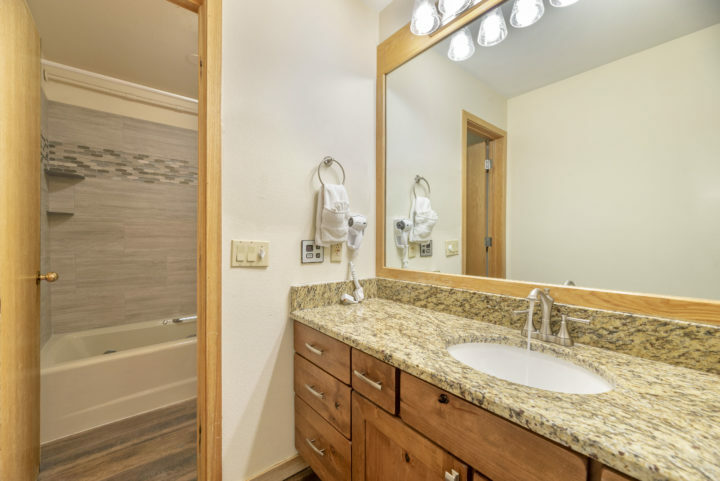 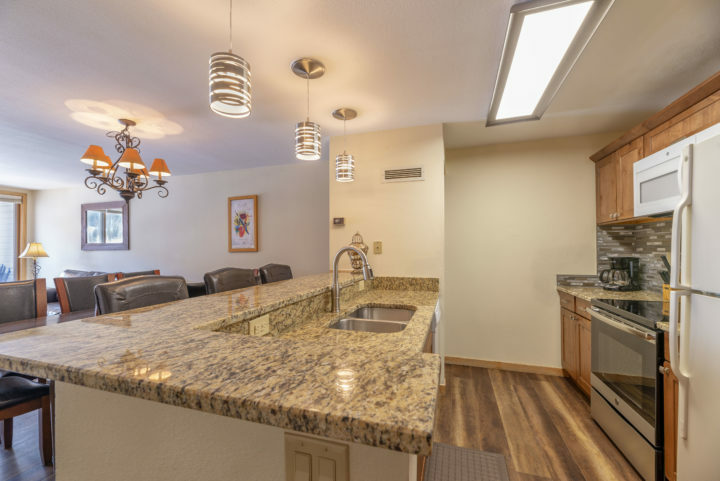 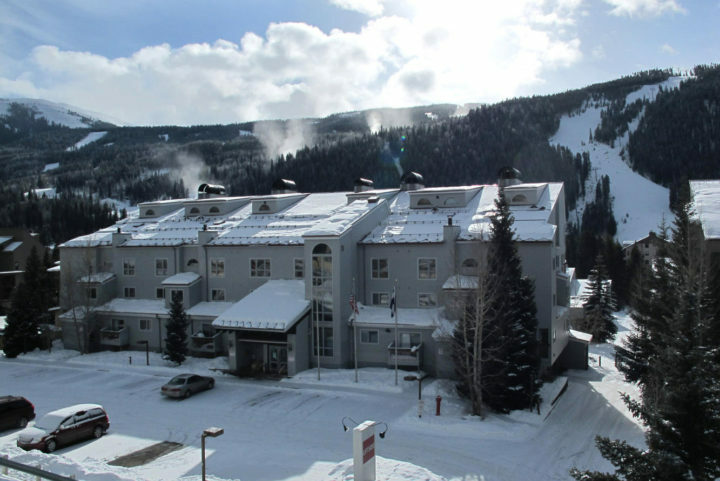 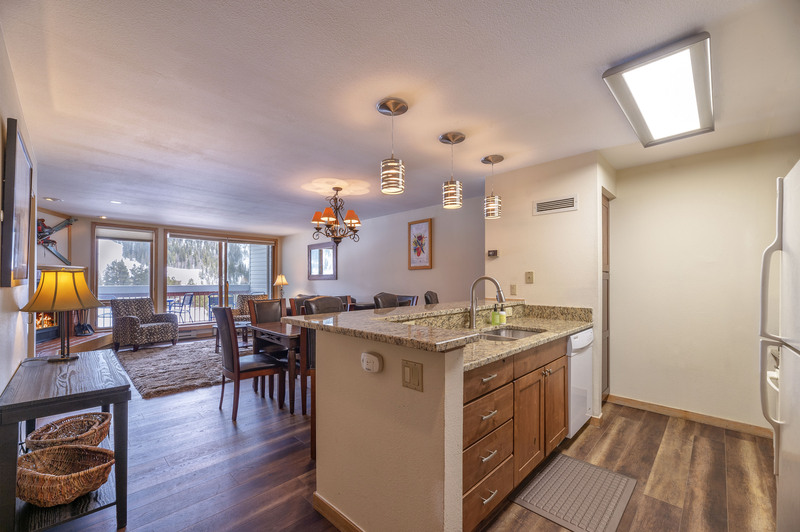 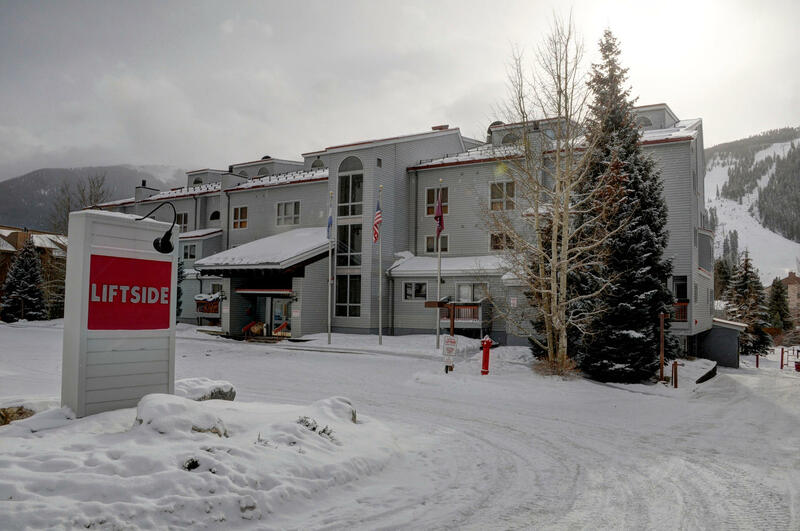 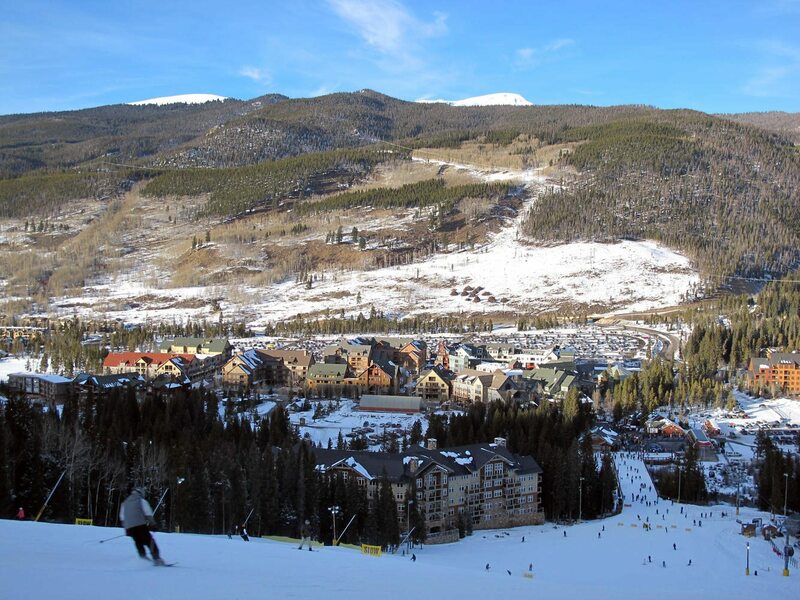 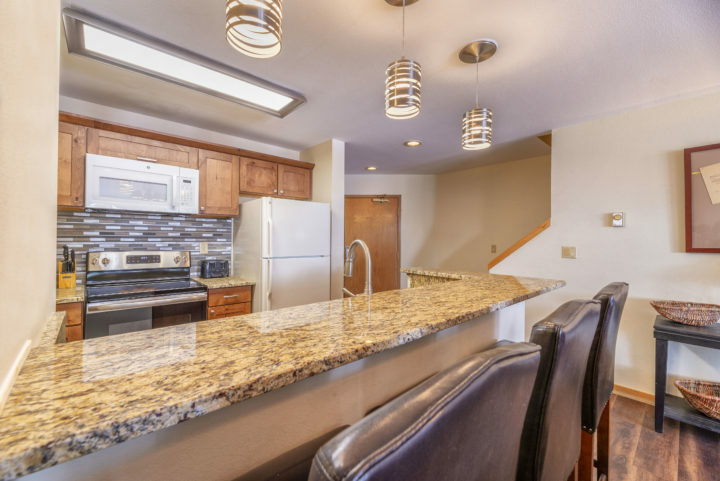 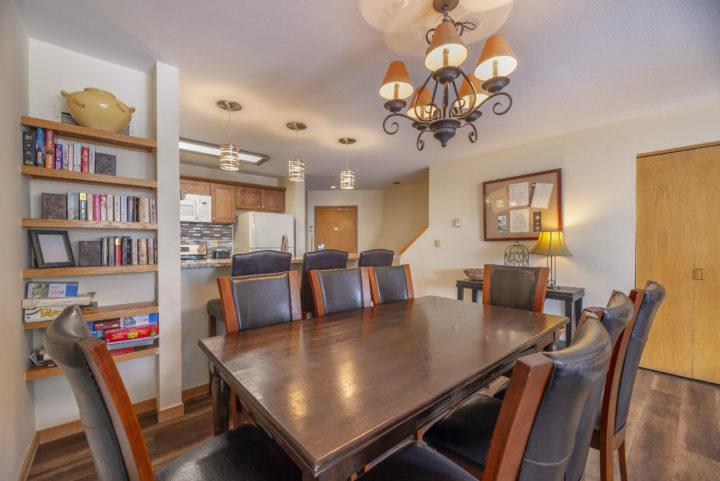 This is one of Keystone’s most versatile slopeside buildings because of its location (3 minute walk to the lifts), view and clubhouse amenities. 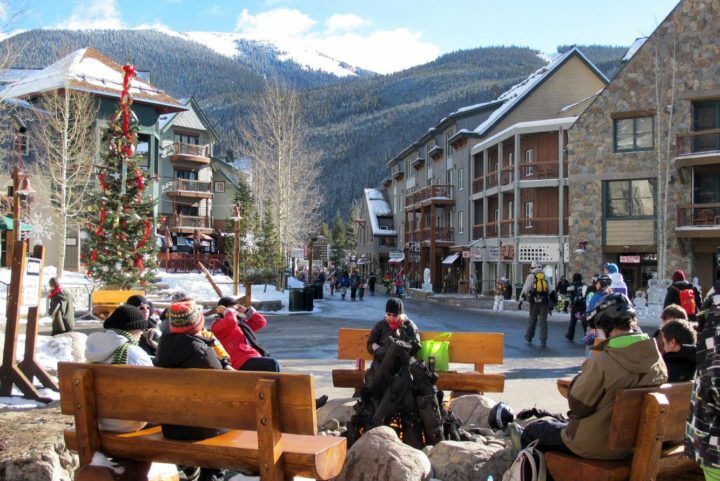 Can also walk to 7 restaurants, 3 night spots (live music), 4 ski shops, internet/sports cafe (with 12 HDTVs), and other activities. 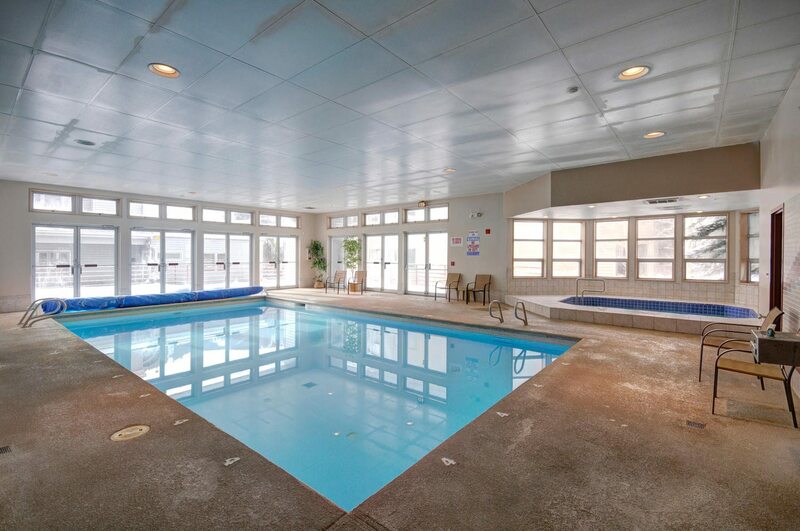 The Clubhouse has a heated indoor pool, hot tub and sauna. 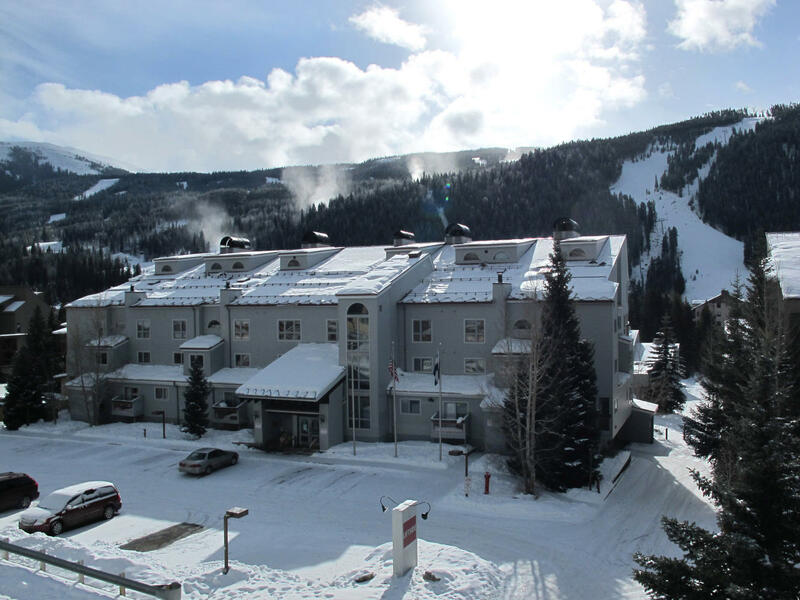 Free underground parking; elevator service. 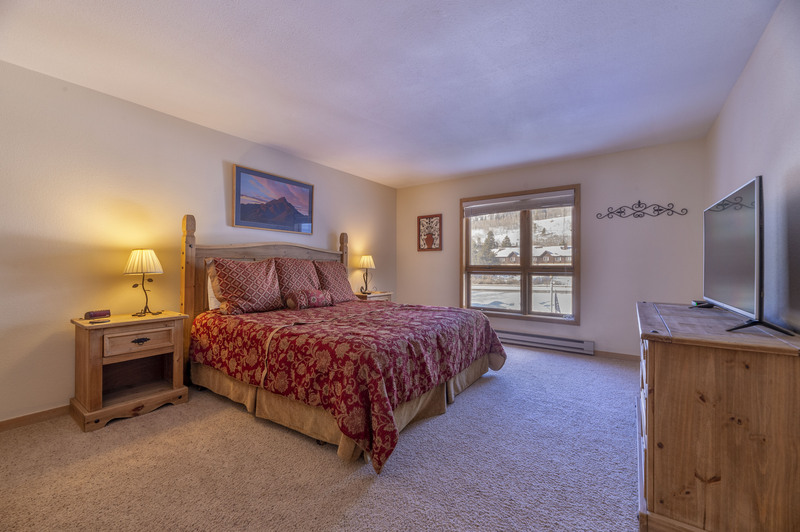 The unit also has a 6′ long portable Twin futon (can be put in any room). Extra linens are provided for the fold outs and futon.